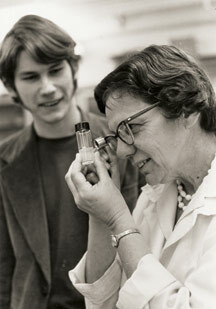 Helen Stafford [biology 1954–87] was the first Reed professor to win a Guggenheim Fellowship. To pursue her PhD, Helen went to the University of Pennsylvania; prejudice nearly prevented her from teaching botany to male students, but she persevered, teaching the course and earning a doctorate in 1951 for her discoveries about plant enzymes. Helen went to the University of Chicago as a postdoctoral scholar; meanwhile, her exemplary record of research, publishing, and teaching impressed Lewis Kleinholz [biology 1946–80], who recognized how much she could strengthen the department at Reed. She arrived on campus in 1954 as the only female faculty member in the division of mathematics and natural sciences. It was a tumultuous time: President Duncan Ballantine [1952–54] resigned her first year and department chair Ralph Macy [1942–55] the next. Biology was the smallest department at the college, and Helen was challenged by the limited facilities available in the basement of Eliot Hall. Helen began lobbying for grants from the newly organized National Science Foundation and National Institutes of Health—both helped provide resources for research. She and her colleagues worked to integrate classroom teaching with vigorous research by both faculty and students, and transformed the department into one of the top biology programs in the U.S.
Helen was a pioneer in many ways. Declining the role of firebrand, she worked tirelessly as a mentor and role model for the next generation of women scientists. “We all loved dinners at her house,” wrote Pam Ronald ’82. “I remember that she was a bit annoyed at us vegetarians. ‘Plants have feelings, too,’ she would say.” “She was a great scientist and a wonderful person,” wrote Jerry Marshall ’82, who was Helen’s thesis student. On the subject of teaching, Helen stated, “I have learned to appreciate how deeply students need encouragement, as well as, say, expertise. 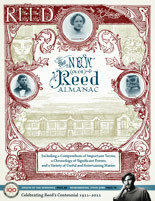 Typically required to work harder than ever before, expected to comprehend unfamiliar and often difficult subjects, obliged to compete with their peers for the first time, and usually subjected to severer criticisms than ever before, students deserve, not merely need, encouragement.” Even as she faced the onset of Alzheimer’s, Helen continued to exhibit the courage and curiosity she was known for with the help of devoted friends and caregivers. A lover of the outdoors and of the dogs who were her constant companions, Helen found a true home in the Pacific Northwest. Ever frugal, she was able to endow the Morton O. Stafford Jr. Scholarship at Reed in memory of her brother, who was killed in World War II. Helen is survived by her niece, Anne W. Scarff of Amherst, Massachusetts, who provided many of the details for this memorial piece. She was predeceased by her parents; brother; and sister, Marie Louise S. Scarff. Helen died August 12, 2011, at her home in Portland, following a long struggle with Alzheimer's disease. Her ashes have been scattered in the Reed canyon.